John Brock readies the P&H for loading. Note the compact control panel. Using the Digital Command Control from System One by Wangrow would make this layout even more compact. 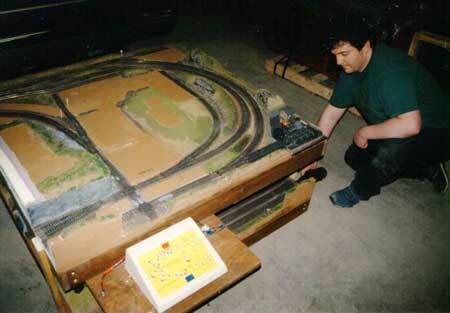 Back in the autumn of 1995, a client asked RailDreams to build a portable HO 4’ x 8’ layout for a party in Pennsylvania. He specified that it must be easily transported in a van or pickup, and feature some interesting scenery. He mentioned that he’d like the layout to capture the feeling of big-time railroading in and around the Pittsburgh area. Out of these requirements grew The Pittsburgh & Huntington. A slow freight passes the end of the yard near Briggs Hill, a local landmark near Huntington. The “Knights of the Iron Road,” fondly called hobos, have been known to frequent this area. The P&H is designed to allow two or three trains to operate with conventional power systems and block control. It offers two mainline runs as well as a central passing track. A small stub yard, five industrial sidings, and an interchange with two diamonds guarded by a tower highlight the scenery trackside. A New York-bound freight train passes through Huntington in the mid-1960s just before the Penn Central era. Conrail and Amtrak serve the town of Huntington on the P&H. An old P&LE branch crosses the busy double track main and heads south into the hinterlands. Huntington overlooks the interchange from its hilltop location with space for several industrial buildings. 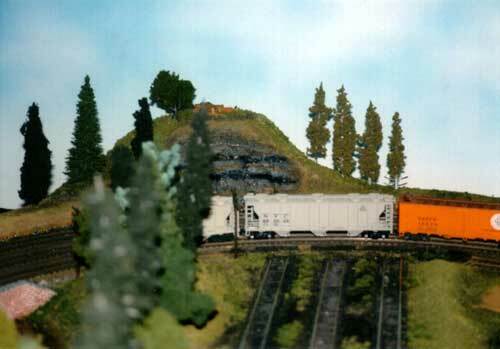 Depending on what era you want to emulate, simply add a coaling facility or diesel support at the base of the Huntington yard for authenticity. 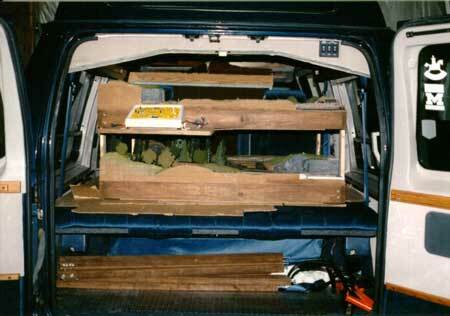 Here is the P&H on its way to the real Pittsburgh in the back of a custom van. The 2 x 2 legs with leg levelers (3/8″ x 4″ bolts with Tee nuts) are loaded below. The P&H is constructed of a 1/4″ plywood base attached to a simple 4′ x 4′ framework made of 1 x 4. One-inch construction-grade foam is attached to the top of the base with Liquid Nails. The track is glued to the foam (the main lines to the cork roadbed). Tortoise switch machines by Circuitron are used throughout. In the case of this particular layout, the natural scenery was completed and “pads” for various city buildings were provided to the client. When the client finishes the layout himself, various DPM and Smalltown USA structures will grace Huntington’s main street. You could use whatever layout of structures and scenery you choose.